Please join Ben Clothier on Tuesday August 12th at 6.30pm CDT for our monthly meeting. 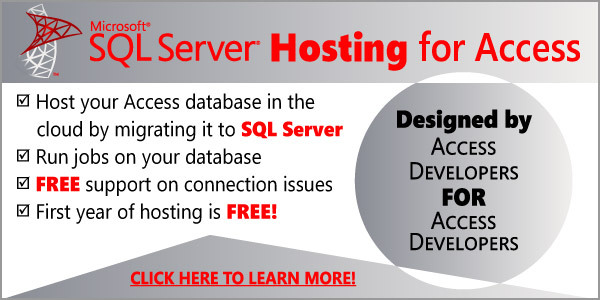 We are excited to have monthly meetings to discuss Access with SQL Server topics! We meet every second Tuesday of the month at 6:30 PM Central Daylight Time (CDT). This meeting will be presented by Ben Clothier. This is a follow-up on Adolfo’s excellent presentation where he mentioned few options such as FileStream and FileTable in passing. Ben’s presentation looks at options that we can leverage if we need to design an Access application that should work with documents with a remote SQL Server using ADODB.Stream. Let me know if you will be attending any of out meetings by dropping me a line here. Also be sure to read our blog for the latest information! “Let me know if you will be attending any of out meetings by dropping me a line here.” leads to a page where it says, “Please use the form below to contact us.” but there’s no form. Is Adolfo’s excellent presentation downloadable and is the 12th August’s meeting available in recorded fashion? 6:30pm CDT is too late for me. Hi Giorgio, the slides for my presentation are posted here: http://sqlserverexperts.net/downloads-for-introduction-to-full-text-searching-in-sql-server-2012/.